The benefits of Artificial Intelligence in banks and credit unions are widespread, impacting back office operations, compliance, customer experience, product delivery, risk management and marketing to name a few. Suddenly, banking organizations can work with large histories of data for every decision made. According to our research, roughly 15% of the organizations are using AI to compete with peers and identify opportunities in their data that would otherwise be missed. Another 23% are expecting to use AI functionality in the next 18 months. But, this is just the tip of the iceberg. Soon, all financial services firms will leverage the power of AI to deliver better experiences, lower costs, reduce risks and increase revenues. We would like to thank the BAI and Deluxe who sponsored this most recent global research on artificial intelligence. Their partnership has enabled us to create a new benchmarking of the early uses of AI in banking and to better understand the impact on the consumer. As more organizations are seeking to use artificial intelligence to increase revenues, decrease costs and improve the customer experience, this research provides a roadmap for implementation and for setting key performance indicators (KPIs). 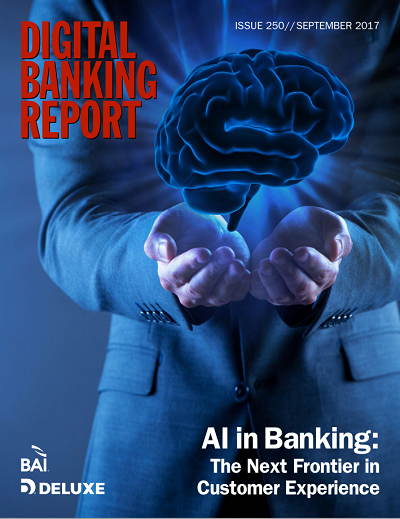 More importantly, we hope that banks and credit unions will use the insight in this report to take action on developing new ways to benefit from the functionality of AI. A global analysis of the state of artificial intelligence deployment in the banking industry, covering key AI functionalities, challenges, future trends and opportunities.